Download PES 2019 Sider SP19 Stadiums R2 single link, released Apr 14, 2019, contains 100 stadiums for PES 2019 SMoKE Patch. This is sider version, you must install the SIDER SP19 so you can install this addon. The stadiums files are big, only manual installation (extract and copy), the sider sp19 should be installed before copying the stadium server files. This server R2 have the most recent updated stadiums and added more to the server. 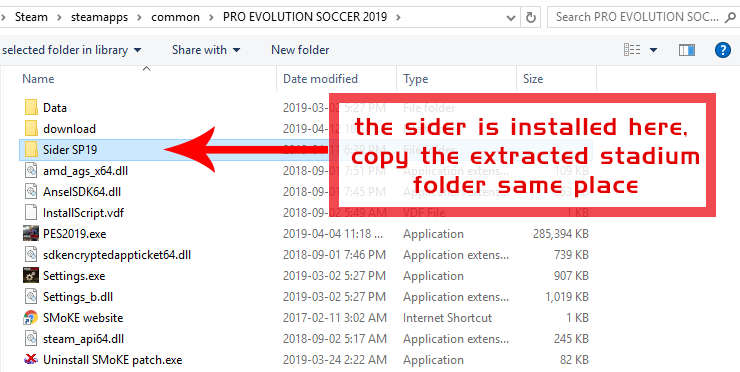 How to install PES 2019 Sider SP19 Stadiums R2? All scoreboards in the server are made by various makers, big thanks to all of them and anyone who worked on this: MJTS-140914, lohan258, Orsest, twich, martinza, S.Elafify, bouquenom, Ismail1795, ThunderGibson, omarbonvi, Ali Tosun, bmpes, zlac, max, samsat, and all PES-Moders. PES 2019 Sider SP19 - Stadiums R2 is a free patch for PES 2019 You can download through 1 server below.